In this Thursday Therapy episode, Glenn Mackintosh shares 7 great tips for making health more of a priority. This episode follows up from TT#10, with a focus on practical tips for how to put yourself – and your health – first. Download Weight off Your Mind Audio Program: http://bit.ly/2aRkhqa (Use Code GMACK for 10% off). Hey guys, welcome to Thursday Therapy. No, it’s not Groundhog Day, we had so many questions and so many comments following up from our last Thursday Therapy that I’ve decided to give you my 7 top tips on how to actually put yourself first. Welcome to Thursday Therapy. The question that we’re reviewing is last week’s question that comes from Margaret. Margaret asks, “Can I learn to let go of my need to ensure others are happy instead of myself?” So, that was a brilliant question and I told you in last Thursday Therapy that absolutely yes, you can do it, maybe you even need to do it. I told you that could be really hard so you got to make room for some growing pains and I gave you a little device to check in with yourself and see whether you actually were being selfish or whether it was just more of a thought in your mind. What I want to do today, because we’ve had so many comments and so much feedback on how to actually do this, is give you my 7 top tips on how to actually put yourself first. Guys, I’m going to go through these really quickly for you and I just want you to really grab a hold of the ones that are useful for you. Because I’m going to go through seven tips, I don’t have time to explain everyone and the pros and cons, so there’s going to be a lot in here that won’t make a whole lot of sense to you but I want you to find those little ingots that’ll really help and I’m 100% sure, there’s no doubt in my mind, that there’s going to be some really good stuff to help you learn to prioritize yourself more. First, I want you to get creative. We live in this world of either/or. Either I can spend time on myself or I can spend time for other people and I want you to start to live in a world of ‘AND’ where, see, you can do multiple things at the same time. An awesome example of this is a lady I’ve been working with recently she wanted to do more movement and spend more family time and she’s simply planned in a Sunday session where they could ride their bikes or go for a stroll outside, brilliant movement and some quality family time. The second thing I want you to do is think about all of the benefits of taking care of yourself. Taking care of yourself is not something frivolous or not something it’s self-indulgent, if you take care of yourself you’re going to think better, your behaviours will be better, you’re going to feel better so you’re doing it for a reason. One of my mentors, a guy named Irvin Yalom, says if you look at the best wood cutters they spend 45 minutes of the hour cutting wood and 15 minutes in the hour sharpening their axe that helps them to be a better performer and so what I want you to do is think about your one-quarter of the time you spend and the benefits of sharpening your axe. The third thing that I want you to do is to reflect on the benefits of your self-care on those people around you. When you take care of yourself everyone wins for example, your boss might not like you taking your full lunch hour but if you’ve had some good nutrition and you’ve had a little bit of a chance to chill out, they’re probably going to like you being a more productive employee for the rest of the afternoon similarly if you have children, your children might not like, you know, mum dragging them to do her exercise session rather than the other way around but they’re probably going to enjoy a more healthy active vibrant mum who can play with them more and who’s got more energy to attend them. Similarly, your wife might not like you taking the time to do those things that are important to you but they probably like it if you’re less grumpy and a more energized motivated husband. So, what I want you to do is think about not only the benefits to you but the fact that when you are your best self, everybody else benefits. The fourth thing that I want you to do, is consider diarising your own self-care. 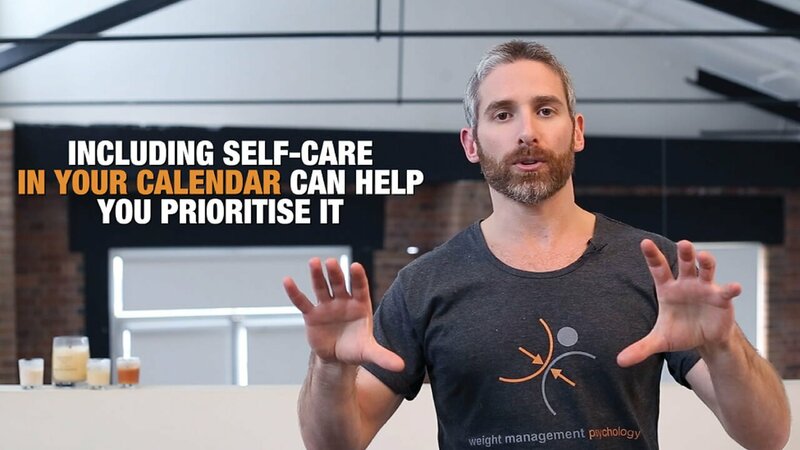 If you want to look at someone’s priorities, you look at their calendar and if you look at your calendar and look at how much time you’re dedicating to healthy nutrition, physical activity, getting enough sleep, all of your important self-care things and it doesn’t add up, consider adding that self-care into the diary that can be a really good way to set the routine and that’s supportive structure and keeping those appointments with yourself just like you would keep an appointment with a client, just like you’d keep an appointment with a family member, that can be a really good way to put yourself up on that priority list. The fifth thing that I want you to do is to enrol some social support. A lot of people who have trouble taking care of themselves are real people pleasers, they say, “Yes” a lot and find it really hard to say “No” and that’s probably not a personality trait that you can just take out of your psyche. So, what we want to do is, we want to use that part of youth for good, so if you’re good at pleasing people, good at making appointments, you might consider a personal trainer, you might consider a nutritionist, you might consider an exercise buddy, someone who you have to please to make your appointments and do those things to take care of yourself. That way we can use your people-pleasing tendency for good, not evil. The sixth thing that I want you to think about is your own authenticity. If you’re giving to someone when you really don’t want to or you’re allowing yourself to be controlled or bullied or manipulated into not doing something that’s important to you, you’re really not being consistent with who you are as a person, and not getting too philosophical but we only have one life to live and I want you to live your life and when you give to other people, I want you to be giving from the heart and when you choose not to, when you choose to take care of yourself I want you to do that in a way that’s right for you as a unique individual. The last thing that I want you to reflect on is your own self-esteem. For a lot of people, giving a lot to other people and not giving much to yourself can be a symptom of low self-esteem. While this is a real psychological cliché, you may find that it rings true for you. So, if you’re thinking that your self-esteem could do with some boosting I would certainly encourage you to walk that path. The good news is there are literally hundreds of ways that you can boost your self-esteem. I’d encourage you to look at some books on self-esteem, you can see a counsellor or a psychologist or a psychiatrist. We also have a program called ‘Weight Off Your Mind’ which is our smallest, simplest program. It’s a little audio program and in that program, we go through boosting your body image, which for a lot of people that I see, is part of your self-esteem. Improving your self-esteem and then listening to yourself and improving your life in any way that you choose. So, a very simple little audio program and it’s only thirty dollars and I’ll even give you our usual discount if you want a ten percent discount just enter coupon code GMACK and you’ll get 10% off that one. So, that could be a really good place to start as well. Guys, thank you for listening to another Thursday Therapy. This is the first follow up Thursday Therapy we’ve done, so I’d really like to hear your thoughts on it, did you like that, would you like me to just stick with one session per topic, what are your thoughts around that and please guys, I actually feel like this one may be more useful than the last Thursday Therapy. I think it’s really important for us to talk through ideas and principles but sometimes I think it’s more important for us to get to the “How To’s” so if you do feel like this is something that helped you please subscribe to our mailing list or our YouTube channel and if you feel like someone else you know, chances are there are a lot of people you know could benefit from some of these tips, please share the love and the video with them and until next time you have a very self-caring, self-loving, self-affirming time. Take care. Hey Buddy!, I found this information for you: "EPISODE 11 7 Simple Ways to Make Your Health a Priority". Here is the website link: https://www.weightmanagementpsychology.com.au/episode-11/. Thank you.